I've been in contact with Marc, who kindly agreed to let me publish his photo on NikonWeb.com. You can see more of his work here. Yeah. Me too. That's much better image quality than I thought the thing would do. If we were closer, like say on the same continent, I'd fire up my old IBM PS/2 Model 80-Kingston which is configured as the super SCSI development machine. This one has *three* SCSI microchannel controllers in it: One to run the drives in the machine and one for use as a SCSI device troubleshooting instrument, The third card is for when one wants to debug computers using SCSI busmaster cards as a micro-Parallel Channel (as in primary/secondary co-processing machines sync'd via SCSI). Think of that use as a *really* local area network with enough speed to allow multiple machines to process the exact same thing at the exact same time (for automatic backup use). Anyway, back in the early 1990's when I was doing all this wild development using SCSI cards and devices, I built this dedicated machine to debug SCSI problems. If you don't use the same SCSI card that runs the machine's drives to t-shoot, then you can see exactly what's going on. I have OS/2 on it and several diagnostic programs specially written to analyze what's going on on a SCSI bus. It's one a very handy tool. Of course, eventually, SCSI was supplanted by other things and so the machine fell into disuse. I know it still works, because I used it to figure out why a notebook SCSI adapter didn't want to communicate with a tower case full of SCSI drives about a month ago for someone. It was an easy issue, as the card was set to a different PUN/LUN than the documentation said and so was conflicting with a drive. Reset the addresses, and it sprang to life. Anyway, if we could get your machine, the DCS, and my machine together, we could tap into your SCSI bus with the diagnostic card in my machine, Then we could see *exactly* what was set to what, what was saying what, and just what is what there - and fix it. But, that's not likely to ever happen. I've thought about testing everything one more time, in case there's something I missed last time. But I have a feeling I have a faulty cable, or something. Well, the nice part about having a rig to test things with is that we could find the fault in less than half an hour. I have all sorts of known-good SCSI stuff, so one starts swapping out things until it works, and then replace one at a time in case there's more than one thing faulty. Sure is handy. If I win the lottery first, I'll pack up my junk, and a M9, and head your way! Come on Lottery! Stan Disbrow wrote: If I win the lottery first, I'll pack up my junk, and a M9, and head your way! Come on Lottery! It's a deal. See you soon then! Yet further proof - if more proof is needed - that a camera is nothing without a pretty girl. And foliage. On a more serious level, and based on the previous picture in his portfolio, it looks as if the camera wasn't too hot with highlights. And it look as though the DCS EOS 5 had just as much trouble with infrared as the DCS 420. Unfortunately I don't have one to try myself, but have you tried taking the hard drive out of the DSU, putting it in an external hdd caddy, connecting it to your pc & dragging & dropping image files to the pc? I assume the dsu has a HDD. Presuming that the thing uses a SCSI hard disk. It well may not. The 100 is old enough that it might have an ESDI connected hard disk in it. Or, shudder, an ST506! I'd actually expect an ESDI in 1990, though, as that was the most common drive type at that time. No. The only answer is that one of us win that pesky lottery! precertvideo wrote: Unfortunately I don't have one to try myself, but have you tried taking the hard drive out of the DSU, putting it in an external hdd caddy, connecting it to your pc & dragging & dropping image files to the pc? I assume the dsu has a HDD. I'm afraid it's not that easy. Here's some info by pfraser, from an old thread: "Rather, the SCSI interface is just considered a high bandwidth link to transfer images to the computer through the Kodak software. There is no file system of any kind on the disk (FAT or HFS). It's just considered a bunch of data." In other words, there are no files to drag and drop. In the same thread you'll also find a link to some inside photos of the DSU. Wait a minute. There has to be some sort of a file structure, at least a simple FAT. They need to keep which sectors and heads and tracks go with which data file, which equals each shot! If it's just a jumble of data written to sectors, then you'd never reassemble anything that looked like an image. Unless they start at track 0, sector 0, head 0 with a file header for the first shot and then proceed sort-of as a Run Length Limited scheme until you run across a file footer denoting the end of the shot. Then, they simply start in with a new file header for the next shot and so on as you switched the heads and sectors and tracks in a logical order. This is a trick I used way back in 1981 or so when we had Winchester drives interfaced to minicomputers (think PDP-8 here, which were already ancient at the time) which were never meant to have such drives attached. So, the thing had to be kept ultra simple but a Winchester offered a *lot* of storage for cheap. Think of interfacing a USB Terabyte drive to a DCS 760c today. It was like that. Those slowpoke machines were meant to use Hollerith cards, paper tape and mag tape. Sequential Data, as it were. So, we used a Winchester as essentially a large piece of tape, or think of it more like a phonograph record (provided you know what one of *those* were!). Oh, that means that the power of seeking directly to the desired data - the whole reason for being for a Winchester drive - was totally lost in the sauce and it became one -large- sequential storage device. If this is what's in the DCS, then that means one would have to go thru each shot in the order it was stored to find the one shot you wanted. That would not be an issue if the whole idea was to dump *all* shots to something else at one go. But, it has a screen to 'chimp' with, sort-of, right?. Do you *have* to run from Shot One thru to the end when using the inboard screen? It makes me shudder to think that Kodak was pulling this ancient trick in the late 1980's with what was then modern computer parts meant to randomly access data! However, even if this is the case, the physical and electrical drive interface would have to be something one could find a controller card for (ST-506, ESDI, SCSI). You'd just have to reprogram DOS to understand that the data is RLL-like and start at 0,0,0 and - Go! I have such a routine for OS/2 that allows such operation on any drive you have attached, so it can be done. I used to have IBM Internal Use versions of DOS that also sported such capability, so it's not unheard of. That said, good luck getting Winders to do something like that. p.s. It occurred to me that the acronym for Sequential Access Data is - SAD. Fits! Stan Disbrow wrote: ..that means one would have to go thru each shot in the order it was stored to find the one shot you wanted. That would not be an issue if the whole idea was to dump *all* shots to something else at one go. But, it has a screen to 'chimp' with, sort-of, right?. Do you *have* to run from Shot One thru to the end when using the inboard screen? 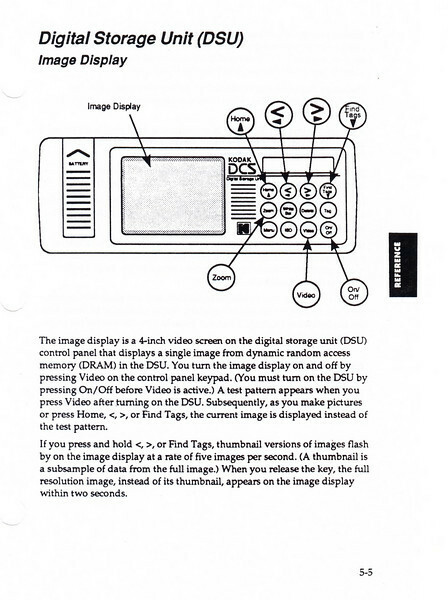 But, at the same time, the manual also refers to the DSU's "dynamic access memory (DRAM)". Another thing: remember that my DSU has a dead internal battery? This means that every time I turn it off - captured images are gone when I turn it back on. Does that make any sense? Why would data stored on a hard drive require a working internal battery? I think they may be loading a FAT into SRAM and not onto the front-end of the hard disk the way we're used to seeing it. That is one way of handling things, and while I've seen that done before it's not considered a good scheme. And, you see a very good reason why! The more we talk about this, the weirder the whole thing becomes! Maybe the next time a DSU shows up and no one wants it (meaning it's dirt cheap with no bidders), I might grab one just to yank it apart and see what in heck is inside the fool thing. It probably would still be useful afterwards, provided it was working in the first place. I'm becoming curious here, anyway. I had never wanted an original DCS, but now I kinda want to know what the guys at Kodak did inside that thing.